Like the phone itself, telephone accessories have evolved over the years. Some have modern equivalents while others have become less relevant thanks to newer and better technologies. For decades, we have accessorized our telephones with everything from answering machines and headsets to colorful cell phone cases and charms. This isn’t necessarily a modern phenomenon. 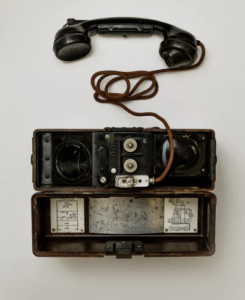 Let’s take a look back at some of the telephone gadgets and accessories through history. Hush-a-Phone — Back in the 1920s, candlestick telephones offered very little privacy. What if you needed to make a confidential phone call and didn’t want others in the room to hear your conversation? This problem was solved by the Hush-a-Phone, a small, rectangular baffle that slipped over a candlestick telephone’s mouthpiece. It featured a round opening for the lips. This allowed the caller to speak privately into the phone. The Hush-a-Phone paved the way for early modems, which used a similar mechanism to transmit tones via a phone’s mouthpiece. It also paved the way for aftermarket telephone accessories after it prevailed in a lawsuit with AT&T. Today, a device called the HushMe is being developed as a “voice mask for smartphones.” The voice mask muffles your voice as you speak so those around you cannot hear your conversations but the person on the other end of your smartphone conversation can. Cord Reel — Corded telephones today have coiled cords, but those of yesteryear did not. Imagine dealing with a six-foot cord (or longer) at your desk each day. It would definitely get in the way! Before the coiled cord was invented, the problem of long cords was solved with a cord reel. This spring tension device had just enough tension to keep the cord coiled and out of the way without pulling the telephone off the desk. The cord reel also solved the problem of babies teething on loose telephone cords by reeling up the slack. Though modern families would be more concerned about baby safety, at the time, the concern surrounding babies sucking on phone cords involved the possibility of short-circuiting the phone. Coiled telephone cords arrived in 1937 with an elastic inner core surrounded by wires coiled around them. This allowed the cord to be stretched when in use and then neatly coiled when not in use. Sound Spectograph — In September 1965, Popular Science reported on the use of a sound spectrograph device to identify the voiceprints of prank phone callers. Today, the U.S. Coast Guard is using a similar technology, voice recognition, to combat an increase in hoax calls from repeat callers. While it’s not necessarily possible to find out exactly who the caller is or ever catch them for that matter, being able to immediately determine that the caller is identical to an earlier one who called in a hoax is helpful in recognizing the prank or hoax and promptly ending the conversation. Answering Machines — Today, when your phone rings, you either answer it or ignore it with the knowledge that your voicemail will kick in the moment you hit “decline.” CallerID helps inform your decision because you instantly know who’s calling. Before the answering machine arrived in the 1090s, a phone could ring at any time, day or night, and the recipient had no other choice than to answer it or unplug it. There was no way of determining the importance of the call, and if you didn’t answer, you’d never know who called or why they called you. Rolodex — Though not technically a telephone accessory, the Rolodex typically sat next to the telephone. Prior to the Rolodex’s invention, most people kept track of their contacts’ telephone numbers and addresses in small address books. They did the job but were impractical when a contact’s information changed. The Rolodex, with its removable cards, was an elegant solution that suited the needs of individuals and business professionals alike. Is it Time to Get an International Virtual SMS Number?